Don’t Be Misled By What You See In The Gym! If you are new to the world of working out, one of the first steps you will most likely take is joining a gym. Gyms are an interesting place as you see all kinds of people from different walks of life going after one ultimate goal: to get more healthy. Whether this be losing weight, putting on size, getting more toned, or simply doing it for functionality purposes; everyone wants to be more healthy and more fit. With that said, gyms can be very misleading on the kinds of things you see and the messages it sends. You will see some of the craziest things when it comes to trying to get fit. From people spending 3 hours a day lifting weights to others jogging on a treadmill for hours at a time to ALL the crazy exercises people do. Do I really have to spend this much time in the gym? Do I really have to run on a treadmill for hours a day to lose weight? If I want to gain muscle do I have to spend that much time in the weight room? Do I really have to do the exercise below to get stronger legs? I do NOT recommend ever trying this! Walk into any gym and you will see multiple people who are at the gym lifting for hours at a time every night. In a previous article we discussed the maximum length in which your workouts should last. In total, including a warm up and cool down, your workouts should never last longer than 60 minutes. The reason for this is when we workout, our bodies naturally produce testosterone. Testosterone levels peek at the 30 minute mark in our workouts then will start dropping back down to baseline at the 45 minute mark. Once we hit 60 minutes in a workout, our bodies start producing less testosterone and start producing more cortisol which can lead to increased fat storage. 30-45 minutes is far enough time to get in a great strength training workout. The myth of having to workout for hours at a time in order to gain muscle and get fit has been debunked many many times. A few examples are here, here, and here. 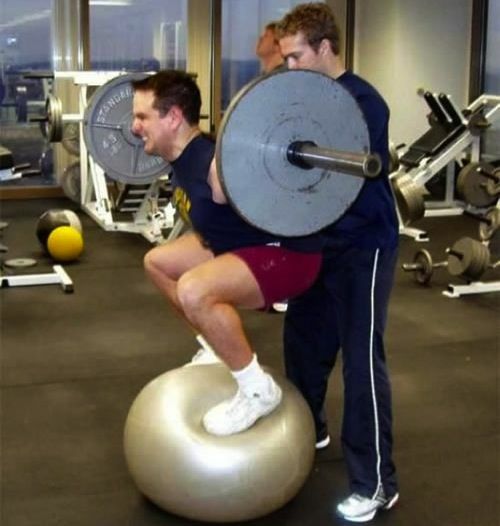 We have discussed this before but this is still something you see everyday at the gym. The reason this can be so misleading is because you may see someone on the treadmill who looks really good and think: “oh so that is how they look so good.” Not even close! When you see someone who looks good doing slow cardio, they are typically doing one of three things: warming up, cooling down, or it is their off day and they wanted to do some light cardio. Cardio is NOT the bulk of their workout routine. In order to get fit, you must incorporate strength training, some high intensity cardio, slow movements (ie. walking), and then of course you must be eating properly. Don’t fall into the trap of thinking that someone looks good by just running on a treadmill for hours. This is the furthest thing from the truth. In order to build those lean muscles and eliminate fat, you must get them stronger by hitting the weight room floor. Keep things simple. Focus on doing big compound movements, mix in some bodyweight exercises, do some high intensity circuits, etc. There is no need for you to be doing all these crazy exercises you see people doing in the gym. These are the exercises that you should be focusing on. You can then add in some bodyweight exercises and a few isolated movements at the end of your workout routines. There is no need for you however to be doing a workout that just consists of all different kinds of bicep curls. Focus on the BIG movements, then throw the bicep curls in at the end if you want. It all starts with your nutrition when trying to get fit, then to speed up the process you must be doing the proper workouts. Getting fit does not have to take hours a day and certainly does not require you to do any dangerous exercises. Have a plan and stick to it. Get focused, hit your workouts hard, and move on with your day! Like this post? If so, hit the ‘Like’ button below!